Tata Motors is launching its much anticipated Zest sedan here tomorrow. With this new car, Tata is looking to claim back ground in the compact sedan segment that it had kickstarted with its Indigo CS. While it is a heavily modified version of the Indica Vista platform (with a boot added), the manufacturer has re-engineered almost every mechanical component and this is an all-new car. Here's a brief look at what you can expect on Tata's new compact sedan. 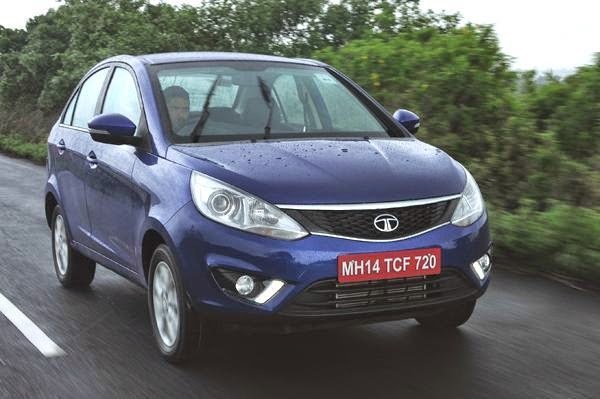 What stands out on the new car is the styling, which is a refreshing change for Tata. While it can still be identified as a Tata, the Zest is a lot more upmarket and modern looking. The lines are more sculpted and there are additions like daytime running lamps as well (on top-spec car). And like the outside, the interiors too look on par with rivals from Honda or Maruti, a significant improvement for Tata. The cabin is smartly designed and fit-finish is a marked improvement as well. The dash gets dual-tone treatment, the seats are more comfortable and there's plenty of equipment too. The audio system is an eight-speaker one with USB, Bluetooth, aux and SD card inputs. The infotainment system even adds a touchscreen on the top variant. With the new Tata Zest sedan, the carmaker has introduced its new Revotron series of motors. The Zest gets a new 1.2-litre turbocharged petrol engine (known as the Revotron) which endows the new car with best-in-class power (88.7bhp) and torque (14.27kgm) figures. It also comes with three driving modes ­– Eco, City and Sport. And there's good news for those who prefer diesel. While the 89bhp 1.3-litre Fiat-sourced Quadrajet engine is familiar, Tata will offer an automated manual transmission (AMT) option on this as well. The AMT is expected to not be priced that much higher than the manual variants and its fuel sipping manners are not likely to differ that much over manuals either. In fact, if Tata gets the pricing right, this could be the most affordable diesel automatic sedan on offer in India. So, Tata is all set to make a comeback with the Zest sedan tomorrow. Stay tuned to our website for updates.